A quick press of Ctrl+D (Windows / Linux) or Command+D (Mac) on your keyboard, and voila! You have added a new bookmark in Firefox. The problem of course is that it is all to easy to accumulate bookmarks, and unless you create bookmark folders in Firefox to organize them, you will soon have a "Bookmarks" menu that scrolls up and down endlessly. Fortunately, Firefox makes it as easy to delete a bookmark, which show you how to do in this tutorial. You will also learn how to delete multiple bookmarks at the same time, something that becomes necessary at times! 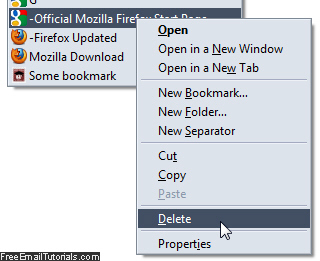 Warning: when you follow the steps below to delete a bookmark from the Bookmarks menu, Firefox will not give you a confirmation message beforehand, and the deleted bookmark cannot be recovered by some command like "Undo Delete" - in other words, once you delete a bookmark, it is gone. Once you are inside Firefox, click on the "Bookmarks" menu, and (if needed) scroll down through the menu until you see the bookmark you want to delete. 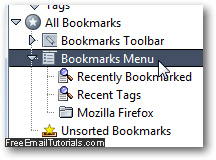 Firefox will silently remove the bookmark from the Bookmarks menu: you are done! Once "Bookmarks Menu" is selected on the left, the content (all your bookmarks and bookmark folders) will load on the right hand side. To delete multiple bookmarks at the same time, select all the ones you want to remove, one after the other. On Windows and Linux, hold down the control key on your keyboard ("Ctrl"), and click on each bookmark you want deleted, while still keeping the control key pressed. Mac Tip: On Mac OS X, hold down the Command key instead of Ctrl. Be careful that here too, Firefox will not give you a warning message before deleting the selected bookmarks - and in that case, an accidental deletion could be dramatic, especially if you accidentally selected all bookmarks in your profile! 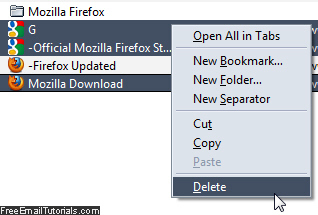 ...And this is how you delete an individual bookmark from the Bookmarks menu in Firefox, or remove multiple bookmarks at the same time by going through the bookmark library.